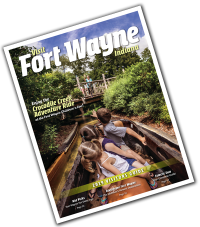 Take an immersive 360° Virtual Tour of Fort Wayne, Indiana and discover our community&apos;s outstanding attractions, vibrant downtown, and welcoming hospitality! Click the link below to open the 360 Tour in a new window on your mobile device. Explore Downtown Fort Wayne streets, activities and attractions, brought to you by the Downtown Improvement District! © 2019 Visit Fort Wayne. The Official Destination Marketing Organization for Fort Wayne and Allen County, Indiana.